Autumn in my part of the world means fantastic fall foliage, football, and apple cider. Unfortunately, this month offers a preview of winter weather. I saw snowflakes today. Ugh. At least that means winter birds are on their way. I’m loving the Tufted Titmice that must have summered to the north but returned to Rochester in time to raid my feeders. Corey had a huge number of birds to choose from this weekend as northwest winds were continuous through New York City all weekend long. 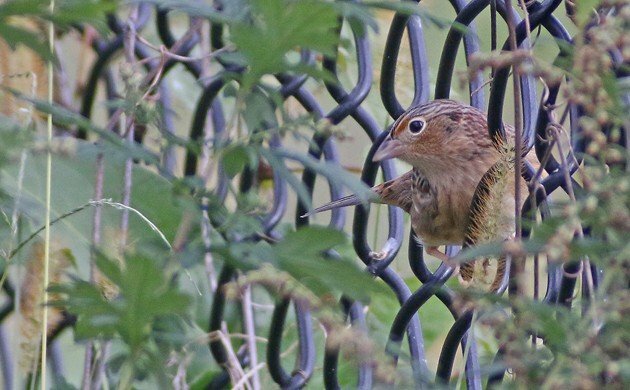 But of all the species he spotted he felt either of the two Grasshopper Sparrows at Kissena Park in Queens was his Best Bird of the Weekend. After all, the two birds doubled his total number of Grasshopper Sparrow sightings in his home borough! White-throated sparrows are here in northern NJ in force now; the backyard looks like the site of some weird geothermal activity when they’re all throwing leaves into the air. Willow Lake Farm in Ambler, PA was surprisingly birdy late in the day. I have to give BBotW honors to my first (and definitely not last)-of-season Dark-eyed Junco. @Rick Wright: Ha! You should totally Youtube that!